It is a big house and we found space. Human beings are one. If one is suffering, then you help one another. When one thinks of war, one imagines a calamity of sound: the blare of gunfire, the clash of combat, the sheer screaming violence of thousands of lives lost. Here in South Sudan, all of that is true: every day brings reports of new clashes, more people killed or forced from their homes. More than 2 million people have fled the fighting, many of them having to move over and over again, often walking for days, as the war continually shifts its borders and safe places turn into danger zones overnight. Frontlines are forever moving back and forth: tracing and retracing paths across the country in the brutal scarification of conflict. But here in Mingkaman, an informal settlement beside the Nile, the full horror of the war is hushed – children play; women walk, straight-backed and smiling, carrying bundles of firewood or bags of food on their heads. Young men wander along the unpaved road, holding hands and chatting intimately, as is common here. The sounds of everyday life are only occasionally interrupted by the thump of a World Food Programme helicopter arching across the sky. It’s a dusty, peaceful scene. 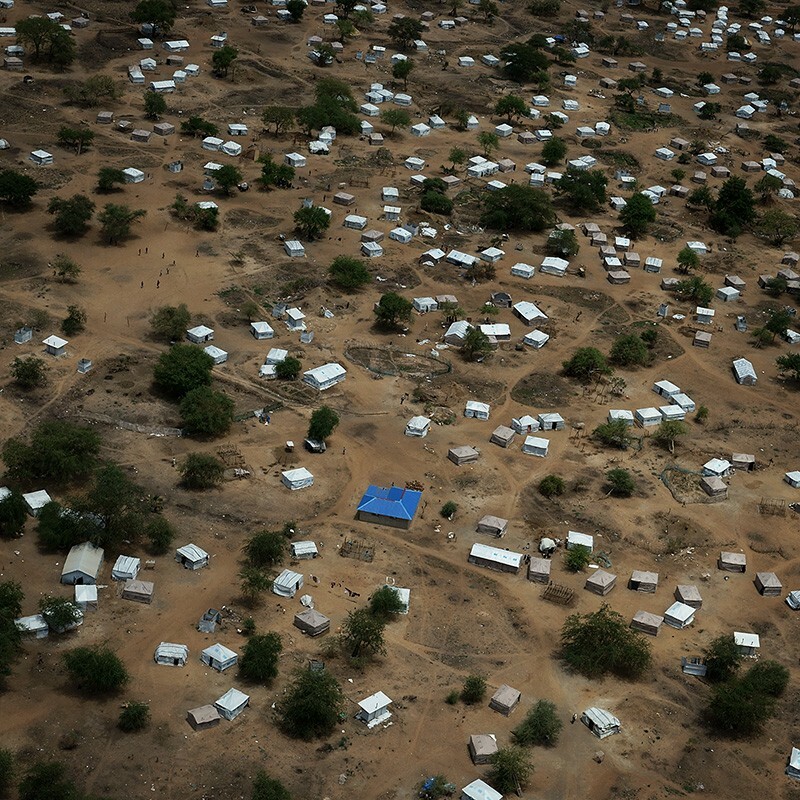 It’s hard to imagine the desperate chaos that drove tens of thousands of people to seek refuge here, when the war spread from the capital Juba across South Sudan sixteen months ago. This isn’t the first war that 28-year-old Reuben has survived. Today he sits alongside his grandfather, with his 3-year-old daughter Nancy climbing on his lap, as he talks about the generations of war that have devastated his country. “Since I was a little boy we experienced war. And now my children are experiencing it too.” Reuben fled the earlier civil war in 1992 and found his way to Kakuma refugee camp in Kenya, where he remained until 2010. “I was only home for 3 years before we experienced war again.” Reuben walked with his family including his grandfather (who tells us he is 100 years old) for 17 days before boarding a boat bound for Mingkaman, which has since become the largest IDP settlement in South Sudan. “When we arrived, things were tough because most humanitarian organizations were not here yet.” Slowly things started to improve. Reuben is now working as a Food Monitor for Oxfam’s food distributions, helping to deliver life-saving food to others who have been affected by the conflict. 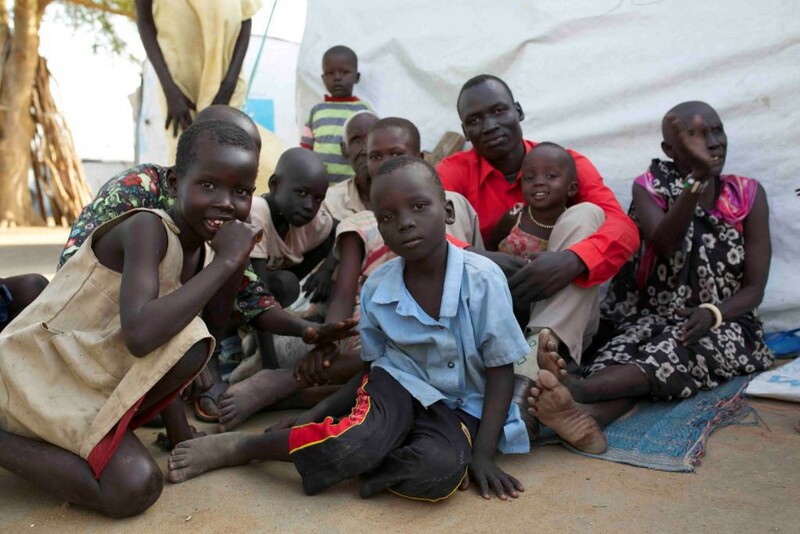 Sadly, the challenges facing South Sudan seem insurmountable. One in three children is malnourished. 2.5 million are estimated to be going hungry. This is the quiet, awful violence of this war: imagine the protracted, terrible pain of watching your children go hungry; the wrenching sadness of having years of your life put on hold because you can’t return home. This conflict has forced 400,000 children out of school, with just one child in 100 finishing secondary school. Aid is making a huge difference and has saved many lives but humanitarian agencies are only part of the response. 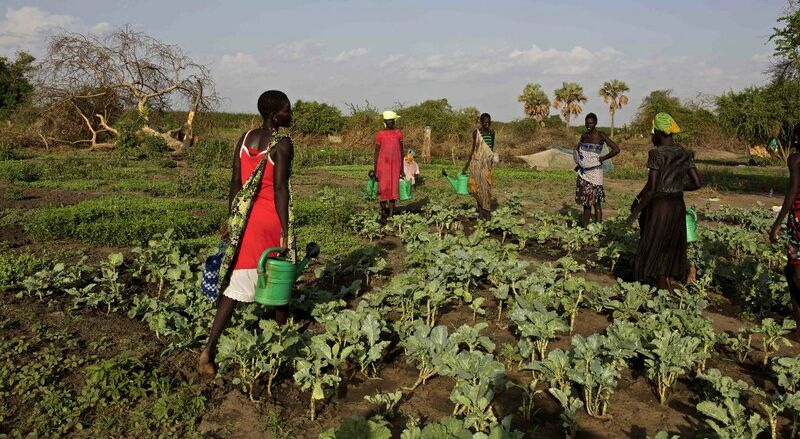 Decades of insecurity and conflict have left a striking legacy and created an inspiring safeguard against hardship: the people of South Sudan are incredibly resilient, and they take care of each other. 26-year-old Nyalwak Akuat is part of the ‘host community’ here in Mingkaman – she is from this area, so although she is not one of those who has been displaced by this conflict, her life has been irrevocably changed by it. When conflict broke out in December 2013 and thousands sought refuge in Mingkaman, Nyalwak opened her home to 5 families. She and her family still share their home with four other families. With food experts projecting 3.5 million people to be severely hungry by the end of June, organizations such as Oxfam have been working through the dry season to preposition food as well as building people’s resilience through providing seed, farming and fishing tools, and training so people are less reliant on food handouts. Speaking through a translator, Nyalwak says she took the opportunity to become a farmer. “Before that I wasn’t doing anything, I didn’t have the opportunity to work. Life was so difficult then, my family did not have enough food to eat. So I decided to change my life.” Now, Nyalwak works from 7am until 7pm, weeding, cultivating the land and protecting her crops from animals. More than anything, South Sudan needs peace. But amid the devastation and din of war, every day people like Reuben and Nyalwak are quietly working to rebuild their lives, to break the cycle of conflict and build a better future for their children. Oxfam programs have helped nearly half a million people access food, clean water, sanitation facilities, fuel, and income support. 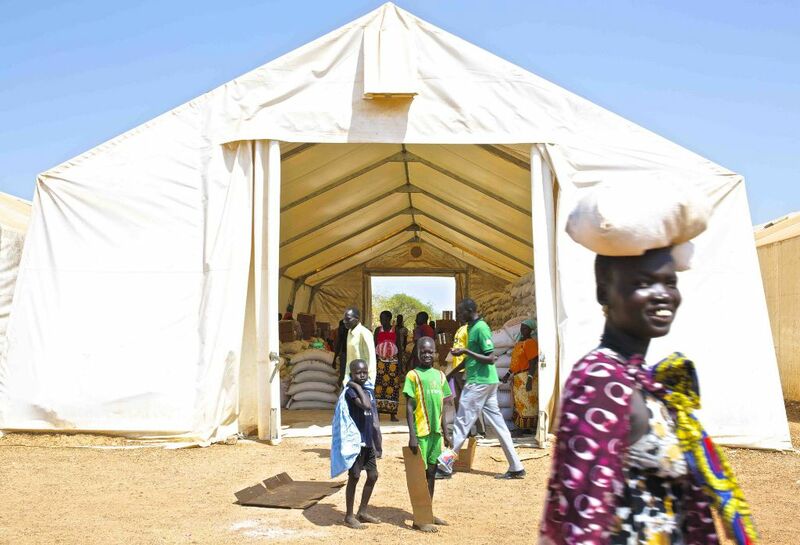 Oxfam coordinates a monthly distribution of food to over 70,000 people in Mingkaman – providing food to people displaced by the conflict as well as those like Nyalwak from the host community. Oxfam is also starting to supplement food distributions with cash vouchers that can be used to buy food from local shopkeepers, in order to reduce dependence on handouts and encourage trade in order to slowly rebuild fractured markets and improve the sustainability of our work.